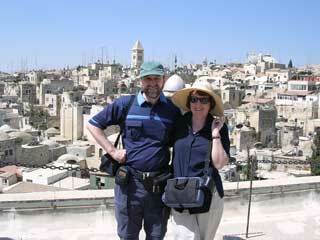 We are just a Christian couple whom the Lord has given a love for the land of Israel, His people and His Book. However we do not want anyone to take our word for it, and we believe that part of our calling is to encourage people from all walks of life to visit Israel at least once on an educational tour so you can see, hear and understand for yourself. After one has seen the old cities and landscapes, one reads the Bible with different eyes." We sincerely hope that you will be blessed by visiting this site.